A mock cladogram of wheeled vehicles, showing ‘transitional’ changes leading to the ‘evolutionary’ emergence of 18-wheeled trucks. Using this as an analogy, but adhering to evolutionistic reasoning, the pakicetids are walking whales in the same way that unicycles are primitive trucks. Mike D claimed our article Creationists are liars was very hypocritical then paraded the evolution-is-science-creation-is-faith fallacy. His email is first printed in its entirety. I have to say, that while this article is interesting, it is still very hypocritical. First of all, the author keeps talking about how evolutionists assume their ideas are true. Ok, yes. They do. But creationists assume their ideas are true, and the evolutionists ideas are wrong, so what’s the difference? Secondly, the author talks about how evolutionists change their ideas when new evidence comes around that does not fit with their theories. That’s because they are SCIENTISTS. They look at evidence, and form theories around it. If new evidence comes around that changes the theory, they change the theory to something that accounts for the new evidence. Creationists, when confronted with evidence that conflicts with their ideas, simply ignore it, use the ‘God did it’ excuse, or distort it to look like something that fits with creationism. Finally, using analogies in an argument is a horrible logical fallacy. I have no idea if the fork and spoon have a common ancestor; I highly doubt it. The two ideas are not even remotely close enough to be comparable. I don’t fully understand why it was even included in this essay. A better comparison might be the evolution of language over time. But again, argument by analogy is a logical fallacy. Dr Tas Walker responds to his claims paragraph by paragraph. It is not hypocritical at all. The difference is that creationists acknowledge that they have made assumptions and are prepared to discuss and debate those assumptions. On the other hand, evolutionists will not acknowledge that they are making assumptions but keep saying they are dealing with facts. They try to silence debate and avoid answering questions by saying things like “Creationism is a religion” or “Creation is not scientific” or “Creation is based on faith but evolution is based on evidence”. All these are false but they have the effect that evolutionists avoid defending their ideas with evidence and logic. See, as I described above, you are falling into the trap that evolutionists fall into all the time. Here you are claiming that evolution is about evidence and creation is about faith. Richard Dawkins keeps trotting out the same wrong strawman. Evolutionists have the idea that Christianity is about faith and then falsely claim that biblical faith is believing things without evidence (see What is Faith? to address this and other misconceptions). That is absolutely the wrong idea of how worldviews work. Both the creation and evolution worldviews begin with assumptions about the nature of reality. Evolution assumes naturalism. As the late Carl Sagan said, “The Cosmos is all that is or ever was or ever will be.” How can he prove that scientifically? He can’t. That sounds like a theological statement, and it is. It is a position that he accepts by faith. And evolutionists do their science by faith, assuming that naturalism is true. Creationists do careful scientific research and come up with answers to scientific problems. But there are lots of phenomena in the world that indicate that naturalism is not enough to explain the world. The fact that the universe is running down means that it could not have existed forever and that processes unlike those we see today were involved in its creation. The fact that you can think and reason means that your brain is more than chemicals and natural processes. The fact that you can appreciate beauty and feel love means that you are more than an electronic circuit that runs on impulses and electrons. The detail being discovered within the living cell points to it being designed and shows that it could not arise by natural processes. But evolutionists just ignore such conflicting evidence because it does not fit with their ideas. They will say things like, “We can’t explain it now but that does not mean that naturalism is not true.” So evolutionists do what you are accusing the creationists of doing. They hold onto their beliefs in spite of the evidence. “Evolution did it! Scientists have not yet worked out how evolution occurred. But there is total agreement on the fact that evolution did occur.” This is a blind faith. They ignore the evidence, or distort things to make it look like the evidence fits with evolution. “Life evolved on the back of crystals.” Ha! What nonsense. And it is wrong to suggest that creationists simply say, “God did it”, when confronted with evidence that runs counter to expectations. Creationists assume that God exists and that he has revealed himself in the Bible, which is taken as accurate and reliable. Yes, this is a position of faith, but there is good evidence supporting that position. But many creationists are SCIENTISTS by any reasonable definition. Creationists do careful scientific research and come up with answers to scientific problems. They do not let go their starting assumptions but they do change their scientific models in the light of new evidence. That is exactly the same way evolutionists work. Have you read the Creation Answers Book? 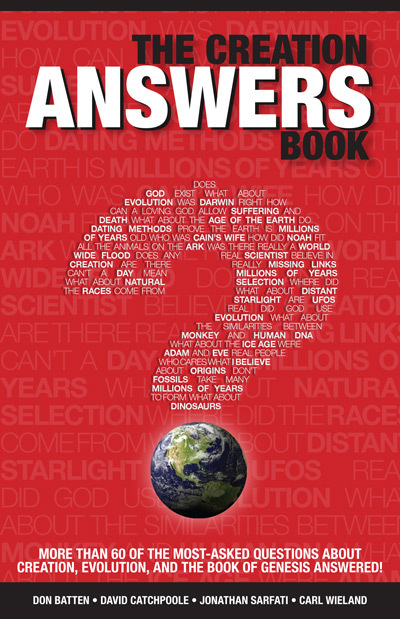 It answers scores of questions about creation and evolution. Have a look at the Q&A page on Creation.com. That deals with thousands of questions and topics that come up. Creationist scientists have produced sound answers to things that have been considered a problem. Sure, the argument is formally fallacious, but it doesn’t mean that it’s always inappropriate. After all, your hero Darwin frequently used analogical arguments, e.g. artificial selection by breeders as an analogy for natural selection. The analogy that so offends you shows that an arrangement of animals and fossils in a cladogram proves nothing about their ancestor/descendent relationship. A cladogram does not prove one animal evolved from another or that two animals have a common ancestor. It only shows how similar the two are in the features that are considered in the cladogram. And that similarity can have a range of explanations, including design. When you say that you “highly doubt” that “the fork and the spoon have a common ancestor”, it seems to me that you are confused about what a cladogram is doing and how that relates to evolution. I suspect you are thinking of the design of the fork and the spoon, and you are wondering if the similar designs were inspired from a more generic design of another piece of cutlery. But the design of an object is totally different from the supposed process of evolution of living things. The fork concept may have been inspired from something else but this inspiration occurred in the minds of the designer. The new design was not the result of an evolutionary process involving the cutlery reproducing other cutlery over thousands of generations. You can arrange any group of objects into a cladogram simply by selecting a range of properties for the objects (length, width, number of appendages, engraving, etc.) and then scoring the properties on each object. You can do it on animals and fossils. You can do it on cutlery and automobiles. The cladogram falls out of this process. When you use this process on forks and knives it is abundantly clear that the resulting cladogram has nothing to do with ancestors and descendents. It is clear because forks and spoons do not reproduce themselves the way living things do. In the same way, a cladogram of animals and fossils says nothing about their ancestors and descendents. Hypocritical … dishonest … fallacious? CMI?